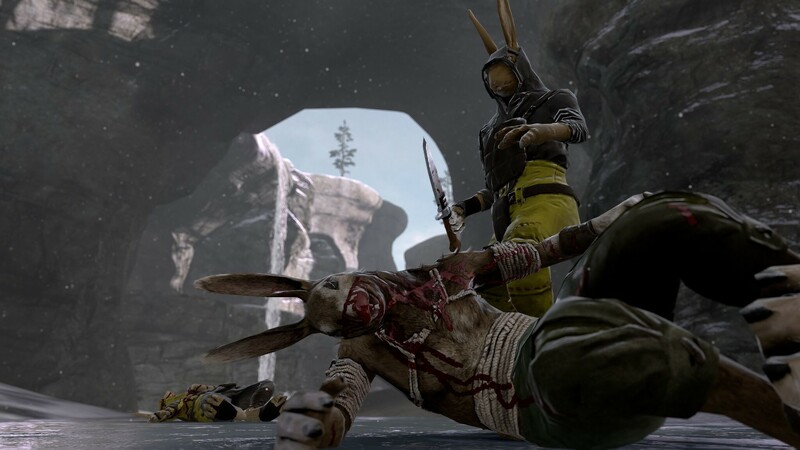 Overgrowth takes place in a world of anthropomorphic animals with a distinctly Watership Down tone. Life is a brutal fight for survival in an amoral world filled with carnivores who have the ability to talk to you before eating you alive. You play Turner, a kung-fu rabbit who is as dangerous as he is gullible, following a nonstop quest for revenge that has him alternating between smashing his enemies’ skulls and mercy-killing his friends. The game plays out as a third-person parkour, stealth, and hand-to-hand combat game with a heavy emphasis on its ragdoll physics engine. Being a rabbit, Turner can leap incredibly long distances from a standstill, producing fights that look like those Hong Kong wire-fu movies that were all the rage after The Matrix came out. 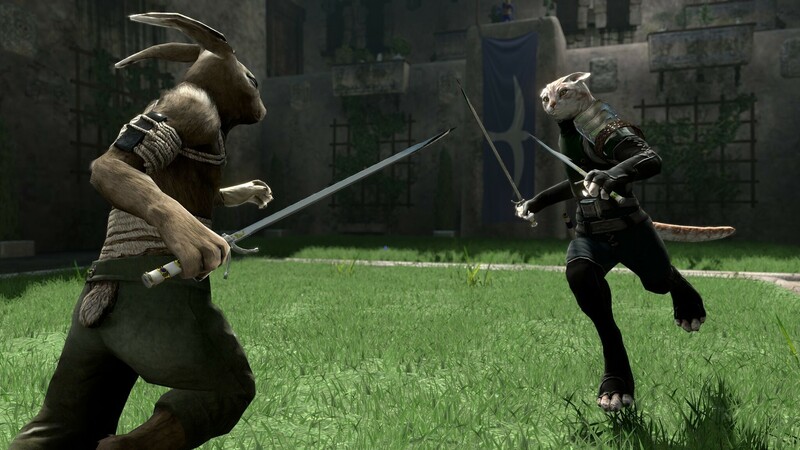 The combat in Overgrowth is quick and brutal. It’s a unique contextual timing-based system with LMB for attack and RMB for defend. You hold LMB and the game will attack as soon as the enemy is in range. If you’re standing still you throw a punch, if you’re moving to the side you throw a roundhouse kick, etc. Likewise with RMB depending on the timing you might simply block a punch, or if you time it just right you’ll grab the enemy and flip them onto the ground, leaving them open to being kicked while they’re down. The ragdoll physics engine plays a major role in the damage output where a flailing enemy that lands on soft grass can jump to their feet and keep fighting, but one who lands on his neck against hard stone is out of the fight. …or just use the one best move in the game, the flying kick. It’s supposed to be the most risky move, and you can injure yourself by screwing it up, but once you get the hang of it you not only dominate everything in the game, it becomes the safest move to use, especially against large groups. Throwing a perfect roundhouse kick in a large brawl leaves you open to get punched in the back of the head, but a successful flying kick not only does more damage than any other move, it bounces you away from the group to safety. Even at max difficulty it’s unstoppable. After nine years of early access, complete with a period of “stress testing” the combat system, how is it that nobody noticed this? This the first and only level in the game where you’ll be dueling with the new cat rapier weapon, so you’re going to have to learn its intricacies on the fly… ha, I kid! Just do the flying kick over and over until you win. 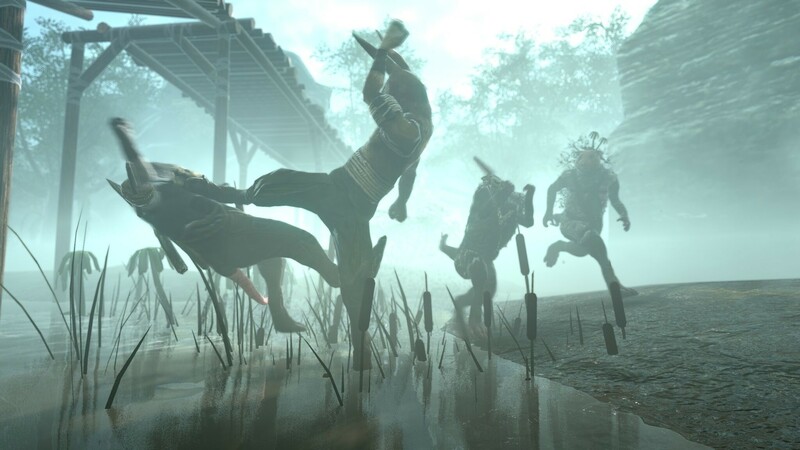 Overgrowth includes the entire 21 level campaign from the original Lugaru remastered with the new engine’s assets, as well as the 29-level Overgrowth campaign. The basic flow of the shorter Lugaru levels is Turner walking into an area with enemies patrolling around ruins and other obstacles to hide behind. He starts out stealthily taking out as many enemies as he can before someone spots him and raises the alarm, at which point the game turns into a desperate fight involving large amounts of leaping and climbing as you try to take out your enemies piecemeal to avoid being mobbed. Overgrowth’s engine supports much larger levels than Lugaru and some of the stages are quite impressive. 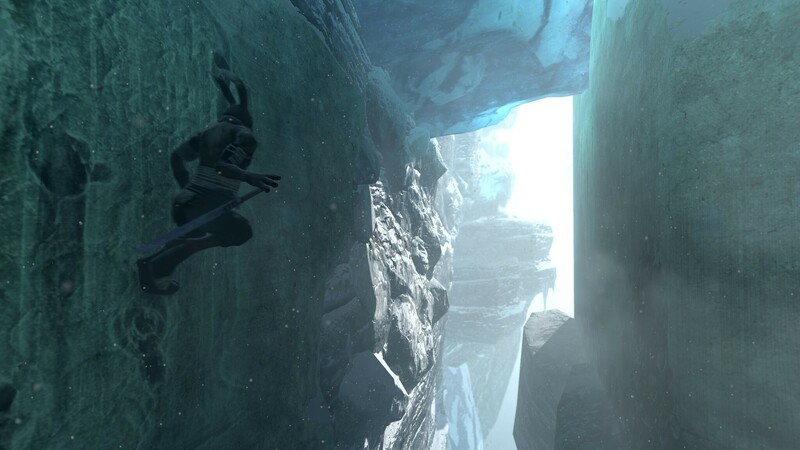 Overgrowth’s big addition to the Lugaru formula is wallrunning, and the best levels in the game have large parkour platforming sections punctuated by sneak/combat encounters. But unfortunately about halfway into the game the levels turn into one-room arena matches, and several are just in-engine cutscenes! They wisely saved the most impressive level for last, but the whole second half of the game feels like a rush job. They had nine years! Why would they need to rush it? I was able to finish the Overgrowth campaign in a single afternoon. The campaign for the original Lugaru was short, but that game also included ten challenge maps with a rudimentary scoring system that let you take the lessons learned in the tutorial-esque story mode and really explore them, like a level devoted to staff combat, or a level that had you stalking through a village full of windy streets. These brought replay value to Lugaru. They’re not in Overgrowth. During early access Overgrowth DID have a really cool arena career mode with scoring measured in your number of fans and random fight generation with adaptive difficulty. But for some reason they ditched it for a barely functional arena mode hidden in the mods section. Aside from three difficulty levels, there’s zero replay value to this short game. To be fair, the game does come with extensive modding tools, but you can’t charge $30 for a game then depend on modders to make it worth playing, especially for DRM-free customers! Obviously it’s a better looking game than Lugaru and occasionally is downright beautiful. There’s a level where you’re battling rats in a shallow swamp filled with flowering lillypads and it’s gorgeous to behold. But things are not uniformly pretty, amazingly the blood effects the designers put so much work into during development look awful. Deep gashes just look like someone drew a line on your model with lipstick. Further, optimization is all over the place. My machine is getting a little long in the tooth, but one foggy swamp level is choppy while the following level with an even heavier fog effect is buttery-smooth. The waterfall splashing effect is the worst, turning the framerate into a single-digit slideshow at the worst time during a platforming section. On top of that the main menu screen and other side elements are incredibly amateurish. Again, nine years of development and this is the result? The special “power” of Overgrowth’s new rat enemies is their ability to wear plants as camouflage, but as an example of lost opportunities in their rushed campaign, there is no point in the story where you’re actually surprised and ambushed by camouflaged rats. Despite all my negative comments, Overgrowth is fun, even with the overpowered flying kick, and I enjoyed the couple hours it took me to finish the campaign just as much as I enjoyed Lugaru a decade ago. The problem is, back then Lugaru was a $10 game whose only competition in the PC indie scene was Zombie Smashers X2. Overgrowth today is $30 and competing with superior fighting games from Skullgirls to Hammerfight to Aztez. Overgrowth did not turn out to be the unmitigated disaster of Cortex Command 1.0, but it is massively underwhelming after 9 years of waiting and I cannot recommend it at full, or even half-price.